Lenny Kravitz opens tonight’s The X Factor with a song off his upcoming album Black and White America, quickly followed by “Are You Gonna Go My Way.” Nice way to kick things off, we got less talking by Worthless Host Steve Jones, and more music. When asked about the highlights of last night’s show, all the judges picked Chris Rene’s original song with Paula Abdul insisting they all had highlights. With only five contestants still battling for the $5 million dollar prize, the show moves along pretty quickly; Nicole Scherzinger’s final act Josh Krajcik is first announced to be safe and through to the semi-finals. Chris Rene joins him with a guaranteed spot, leaving Marcus Canty, Rachel Crow and Melanie Amaro left to await their fate until after the commercial. First we get treated to the legendary and magnificent Mary J Blige performing a song from My Life II…The Journey Continues. Melanie Amaro is also shooed into the Semi-finals, leaving Rachel Crow and Marcus Canty to duke it out with a survival song and that final spot for next week’s live show. Marcus goes first and sings the best song he possibly could have; “I’m Going Down” by the Ms. Blige, herself…gutsy and smart choice. He did wonderfully and at the end looked spent and nervous, he appeared more calm the previous two times he’s been in this position. My sweet little Rachel left her heart on the stage with “I’d Rather Go Blind” which was also the best she could have done. These two did equally well tonight; I really can’t see one staying over the other. Rachel finishes with tears streaming down her face. She did everything she possibly could and hasn’t sounded that good in weeks. LA Reid goes first with his decision on who would go home, he predictably saves his guy and send home Rachel, Simon saves his girl and sends home Marcus, (why do we even ask their mentors? ), Paula sends home Marcus, leaving Nicole with the power of sending us to deadlock or eliminating Marcus. 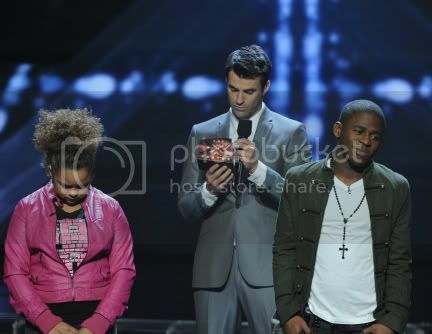 She goes to a deadlock and Steve Jones reveals Rachel Crow received the lowest votes and has been eliminated. It’s a big shock seeing as how Marcus has been in the bottom three times now, he should have gone home, heeding the clear message that he’s not getting or gaining the votes to win this. I think LA Reid knowingly screwed Rachel over last night by letting America know Rachel has gotten offers from “Hollywood.” Which makes many people think, “Oh, she’ll be fine!” and take their votes elsewhere. Rachel sobbed to her mom, I mean a guttural, full body wracking cry, and it was horrible. This leaves Simon Cowell with Melanie Amaro as his only act remaining. Next week begins the countdown to the finale, which crowns the first X Factor (USA) champion on Thursday December 22. 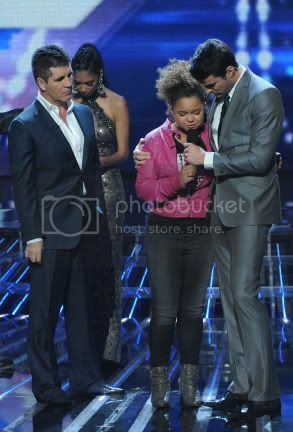 Did America get it right in sending Rachel Crow home? What is Marcus Canty’s appeal that keeps him around, just barely? Check back for my conference call with Rachel and more details about the upcoming shows as I get them.